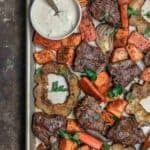 Sheet Pan Mediterranean Baked Lamb Chops with Root Vegetables. A special marinade with quality EVOO, garlic and warm spices adds all the flavor. Gluten Free. Salt lamb chops. Season lamb chops with Kosher salt on both sides. Set aside at room temperature while you prepare the remaining ingredients. Prepare Acorn Squash. Microwave the acorn squash for 1 to 2 minutes (this helps soften it a bit for cutting.) Handle carefully. When cool enough to handle, place acorn squash on a cutting board. Cut stem off, and trim both ends about 1/4 inch. Cut acorn squash in half crosswise, and scoop out the seeds. Now, take each half and cut into 1/2-inch thick rings. Dip Vegetables in Marinade. Add the vegetables (sliced acorn squash, onions, sweet potatoes, and carrots) to the marinade bowl with the garlic marinade (you may need to do this in stages.) Give them a quick toss, then transfer vegetables to a large sheet pan. Season with kosher salt. Marinate Lamb. To the marinade bowl, add more extra virgin olive oil. Add white wine vinegar, and the remaining spices. Mix well. Add lamb chops in and toss to coat. Set aside to marinate. Bake Vegetables. Place vegetables in heated oven and bake for 15 minutes or so. Drizzle with honey. When ready, remove pan from oven and immediately drizzle honey all over the lamb and vegetables. Garnish with parsley. Serve immediately with tahini sauce, if you like. A bright salad is a good addition to start this meal. Recipe note: If acorn squash is not available to you, you can eliminate it and use more of the sweet potatoes and carrots or add another root vegetable. Pro tip: Salt the lamb chops before you do anything else to allow the salt some time to flavor and tenderize the lamb chops. Pro tip: While the extra virgin olive oil provides juiciness, and the spices provide flavor, we need the added citrus from the white wine vinegar to help break down the lamb chops so that the spices penetrate more deeply. That’s why the white wine vinegar is added to the marinade at a later point. Recipe Note: Store leftovers in fridge for up to 3 days. Heat in medium-heated oven as needed. Used in this Recipe: Private Reserve Greek extra virgin olive oil (from organically grown and processed Koroneiki olives.) And from our all-natural spices: allspice, paprika, and nutmeg. SAVE! Try our Greek EVOO Bundle or Ultimate Mediterranean Spice Bundle. Create your own 3-pack or 6-pack from our spice collections! Visit TMD Store.